HomeComputingHow to Convert PDF to MS Word Format? How to Convert PDF to MS Word Format? It is very easy to copy text from (Adobe) PDF files to MS Word document. However, it will a bit tedious when the PDF files are large with many pages and you wish to copy those whole text in PDF to MS Word document. So you need a software or website that can do the jobs easily for you. Here are few useful resources that you can use to convert PDF documents (.pdf) into Microsoft Word (.doc) format files for free! Hope you will find them useful! Quickly and easily create editable DOC/RTF files, making it a cinch to re-use PDF content in applications like Microsoft Word, Excel, OpenOffice, and WordPerfect. It is free! Zamzar is a free online file conversion. Select files or URL to convert(up to 100MB). You need to enter your email address in order to receive the converted files. Just select destination file format, attach the file(s) to convert and hit send. Check your inbox for the incoming KOOLverted file(s). Convert PDF to Word for free. You don’t have to provide your email address. The Word document will be ready immediately after the conversion is done. 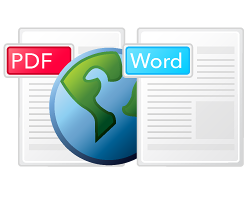 Besides convert PDF document To Word online for free, now you can also download the “Pdf To Word Converter Software”!